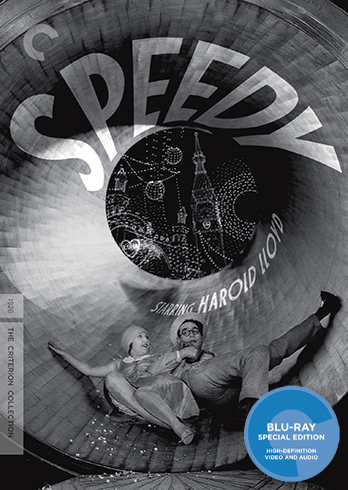 Harold Lloyd's final silent comedy, Speedy, is a zippy, fast paced romp about a young man trying to save the horse drawn carriage business of the father of the girl he loves. As villainous railroad barons conspire to take the cart and take over its tracks, Lloyd leads them on a series of misadventures, including a street brawl and a breakneck chase in a horse drawn carriage through the streets of New York. It's not a coincidence, I think, that Lloyd's final silent film is about a man trying to protect a traditional mode of transportation, only to give in at the end and accept that modernity is inescapable. After all, he was a man facing the end of silent film and the beginning of the sound era. You'll find no such thematic weight in Speedy, though. At least not overtly. Lloyd always rejected the sentimentality of Chaplin and the droll cynicism of Keaton. Lloyd just wanted to have fun, and Speedy has it in spades. Lloyd's dynamic set pieces never quite measure up to his more famous contemporaries, but it's hard to deny their technical skill, especially in the white-knuckle climactic chase scene (which, it was recently discovered, led to an actual carriage crash and a cover-up). Lloyd's "everyman" persona is appealing as always, and he makes the most of it here, sending him through a comedy of errors of a man whose irrepressible spirit can't be dampened, even after mundane mishap after mundane mishap. Lloyd was the comedian of the regular Joe, and Speedy, while not as technically accomplished as Safety Last, is a lively, spirited good time. Criterion's new Blu-Ray edition comes on the heels of their recent releases of The Freshman and Safety Last, making Grandma's Boy the only major Lloyd film not available on Criterion Blu-Ray. Lloyd fans will find a lot to feast on here, but the real highlight is the inclusion of Bumping into Broadway, another New York centered Lloyd two reeler from 1919 that showcases more of his famous "Glasses Character." 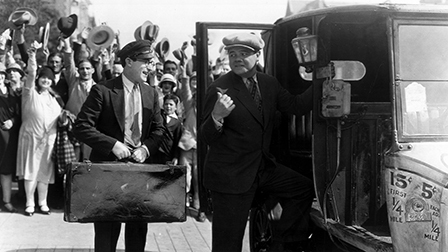 Lloyd may not be as revered by cineastes and historians as Chaplin and Keaton, but he has a warm-hearted, easy-going style that stands apart from those giants of silent comedy. The new Criterion Blu-Ray provides a window into his unique genius, revealing why Lloyd deserves a place alongside his more famous contemporaries as an enormous talent with a unique and singular voice.